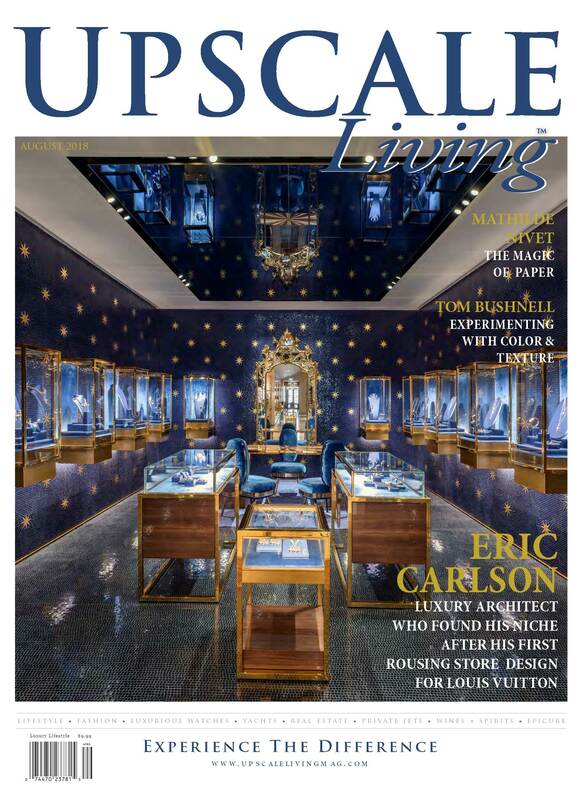 Tom has been featured in the August edition of Upscale Living Magazine in Issuu, the world’s luxury portal. Below are the cover and feature pages with the text available to read at the bottom of this page. 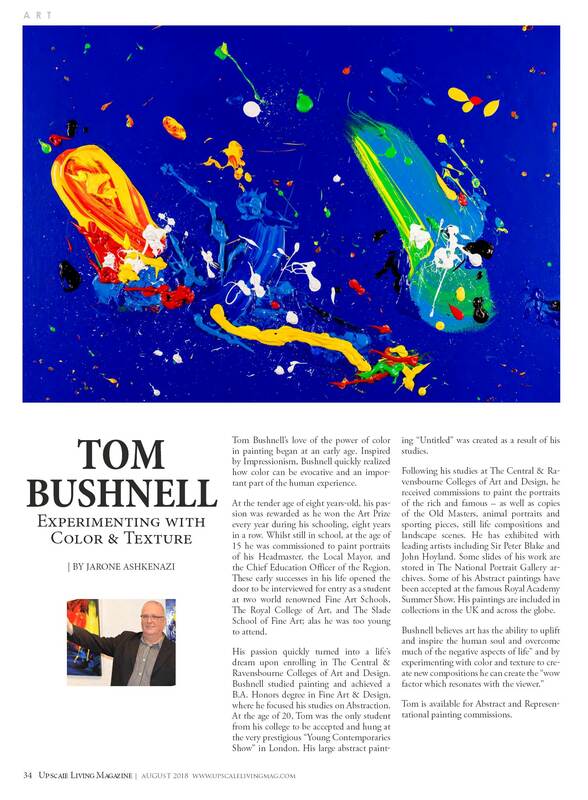 Tom Bushnell’s love of the power of color in painting began at an early age. Inspired by Impressionism, Bushnell quickly realized how color can be evocative and an important part of the human experience. At the tender age of eight years-old, his passion was rewarded as he won the Art Prize every year during his schooling, eight years in a row. Whilst still in school, at the age of 15 he was commissioned to paint portraits of his Headmaster, the Local Mayor, and the Chief Education Officer of the Region. These early successes in his life opened the door to be interviewed for entry as a student at two world renowned Fine Art Schools, The Royal College of Art, and The Slade School of Fine Art; alas he was too young to attend. His passion quickly turned into a life’s dream upon enrolling in The Central & Ravensbourne Colleges of Art and Design. Bushnell studied painting and achieved a B.A. Honors degree in Fine Art & Design, where he focused his studies on Abstraction. At the age of 20, Tom was the only student from his college to be accepted and hung at the very prestigious “Young Contemporaries Show” in London. 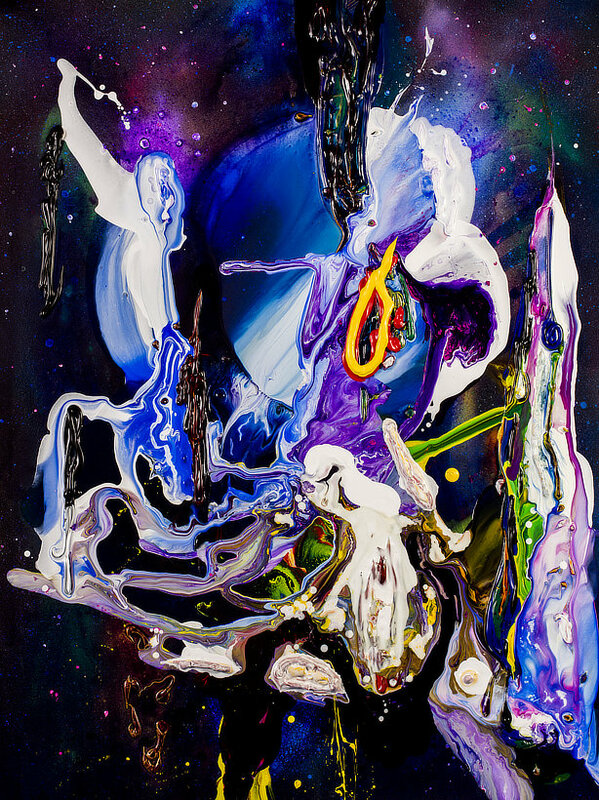 His large abstract painting “Untitled” was created as a result of his studies. Following his studies at The Central & Ravensbourne Colleges of Art and Design, he received commissions to paint the portraits of the rich and famous – as well as copies of the Old Masters, animal portraits and sporting pieces, still life compositions and landscape scenes. 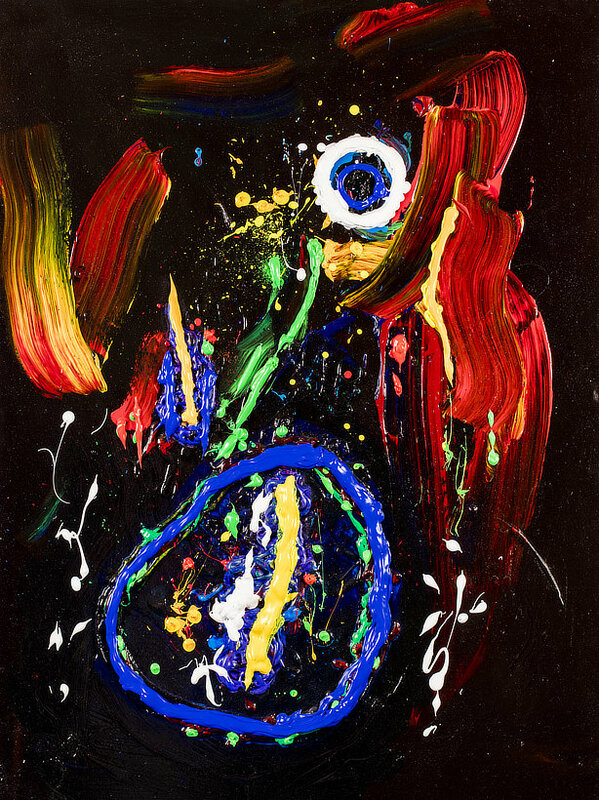 He has exhibited with leading artists including Sir Peter Blake and John Hoyland. Some slides of his work are stored in The National Portrait Gallery archives. Some of his Abstract paintings have been accepted at the famous Royal Academy Summer Show. His paintings are included in collections in the UK and across the globe. Tom is available for Abstract and Representational painting commissions. At the tender age of eight years-old, his passion was rewarded as he won the Art Prize every year during his schooling, eight years in a row. Whilst still in school, at the age of 15 he was commissioned to paint portraits of his Headmaster, the Local Mayor, and the Chief Education Officer of the Region. These early successes in his life opened the door to be interviewed for entry as a student at two world-renowned Fine Art Schools, The Royal College of Art, and The Slade School of Fine Art; alas he was too young to attend. Following his studies at The Central & Ravensbourne Colleges of Art and Design, he received commissions to paint the portraits of the rich and famous – as well as copies of the Old Masters, animal portraits and sporting pieces, still life compositions and landscape scenes. 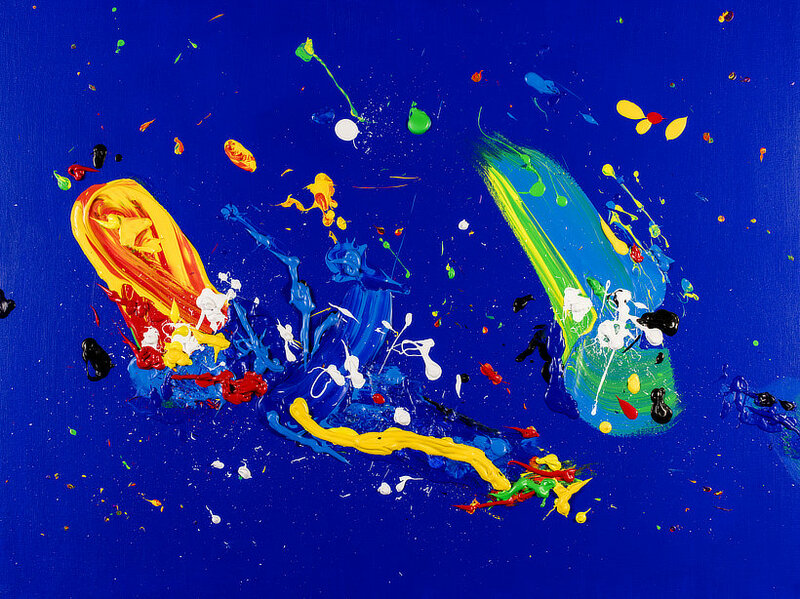 He has exhibited with leading artists including Sir Peter Blake and John Hoyland. Some slides of his work are stored in The National Portrait Gallery archives. 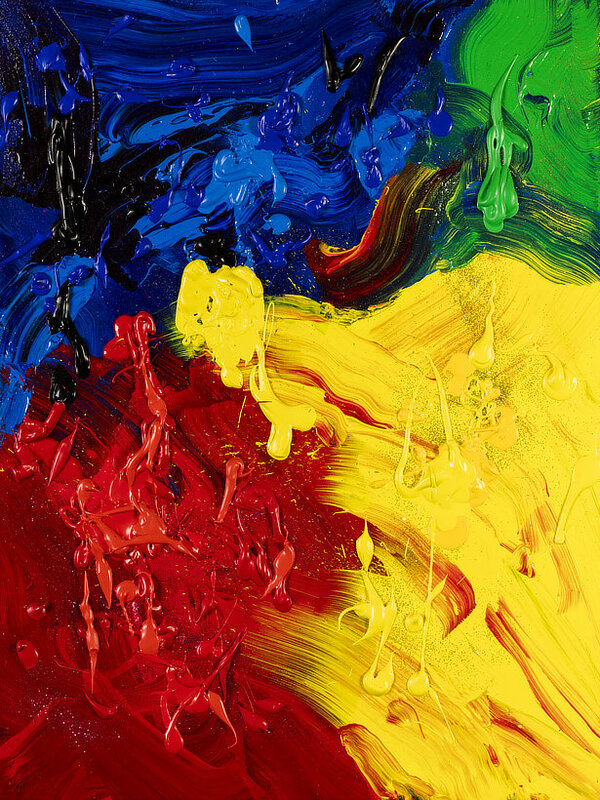 Some of his Abstract paintings have been accepted at the famous Royal Academy Summer Show. His paintings are included in collections in the UK and across the globe. “Joi de Vivre” painting 40 inches x 30 inches.